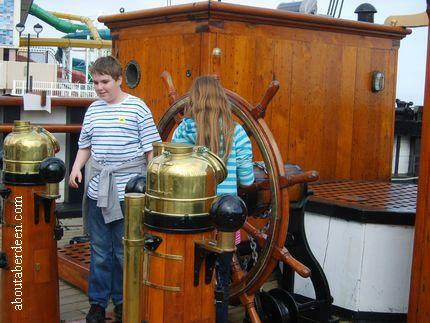 The RRS Discovery Ship Dundee sits proudly on the docks at Discovery Quay and visitors can board the ship and walk around the deck, cabins, galley and engine rooms. Access is gained via the visitor centre and tickets and a guide book can be purchased from the information desk. This gives you entrance to the RRS Discovery interactive museum and visitor centre and then outside to the Royal Research Ship Discovery. RRS Discovery was purpose built to explore the uncharted Antarctic area for the 1901 British National Antarctic Expedition. The then President of the Royal Geographical Society, Sir Clements Markham, saw the expedition as a scientific exploration whilst the ship's Captain, Cpt Robert Falcon Scott of the Royal Navy (RN), vision was to be the first to reach the South Pole. RRS Discovery was launched on the 21 March 1901 by Lady Markham and began her voyage from Cowes, the Isle of Wight on the 6 August. 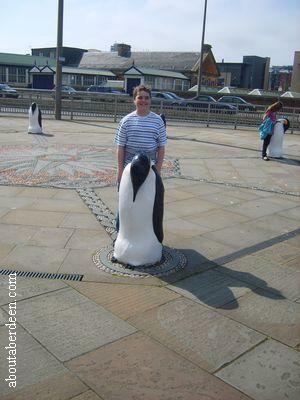 Outside the dome Discovery Point visitor centre are several statues of penguins. Visitor toilets and a disabled toilet are immediately on the right of the entrance and the information desk in straight ahead. 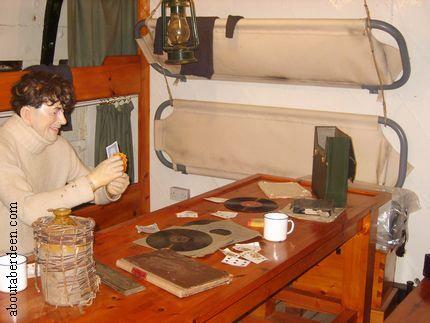 The RSS Discovery Ship experience in Dundee, called The Discovery Point, starts by telling the story in a small cinema room of the planning of the 1901 expedition. 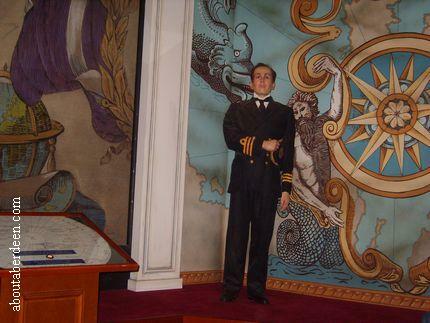 Actors have dressed up in period costume as they tell their tales on the screen with models of RSS Discovery crew by the sides of the screen. The next room of the Discovery Point visitor centre exhibition describes the building of the Royal Research Ship Discovery and the three year's worth of provisions and equipment taken aboard. 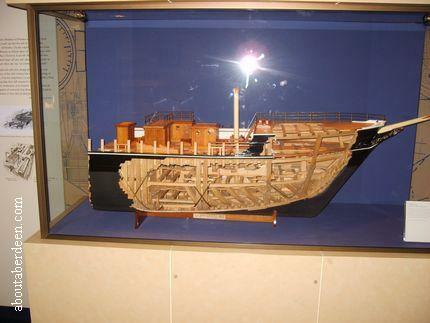 This includes details of how RSS Discovery Ship was specially built with timber and rock salt boxes to survive harsh winter weather and the pack ice and three masts to preserve coal supplies. 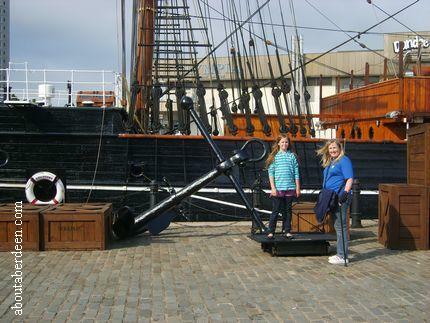 There is also information about that period of history and a general history of the shipyards and whaling in Dundee. Children can play with a crane here and load aboard crates of provisions. 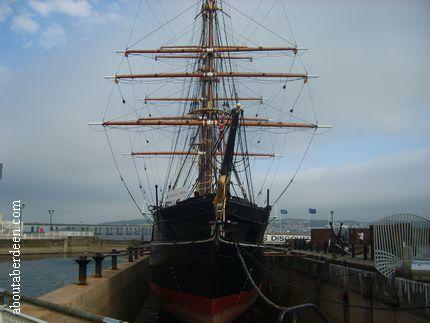 Dundee was chosen as the shipyard to build RRS Discovery in the Panmure Yard because of their experience in building whalers ships that could survive Arctic conditions and ice. 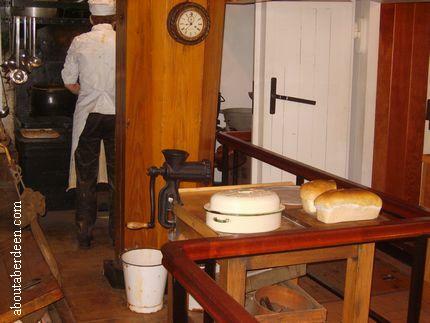 Examples of provisions within the Discovery Point visitor centre include large tins of Cadbury's breakfast chocolate and a huge tin of Colman's mustard which was used to flavour the food. Many food companies provided their products for free to gain publicity and this included Bird & Sons who provided custard powder and Evans who provided lime juice. 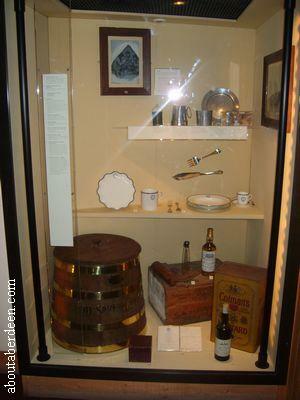 Though alcohol was taken aboard, for medical comforts, little was drunk and there is whisky on display that was never opened by the crew of RRS Discovery. 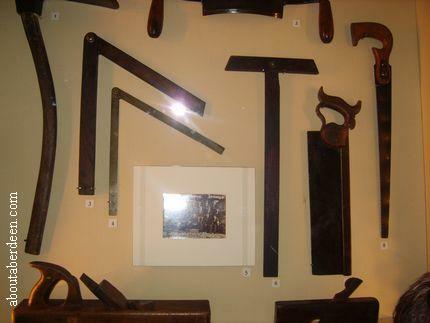 Other provisions taken on board by the RRS Discovery crew included sledges, explosives, rocket flares, one hundred books for the ship's library, candles, tents and timber to build huts. 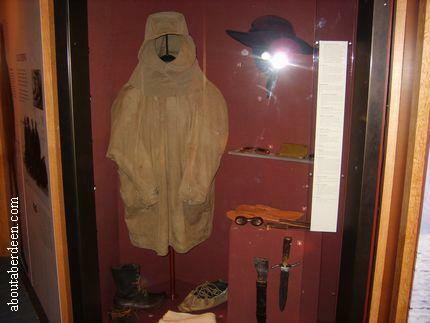 Clothing on show includes a polar jacket clothing and Captain Scott's pipe and tobacco pouch. In a large cinema room is a special film called Locked In The Ice which tells the story of their voyage and how the crew of RRS Discovery survived during two years trapped in the ice. 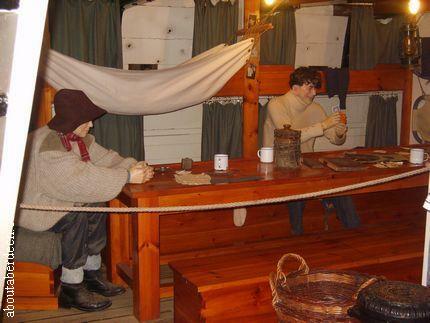 This included the sailors describing the taste of roast penguin and how Captain Scott did not want to abandon the RRS Discovery in the ice and go home on relief ships Morning and Terra Nova. 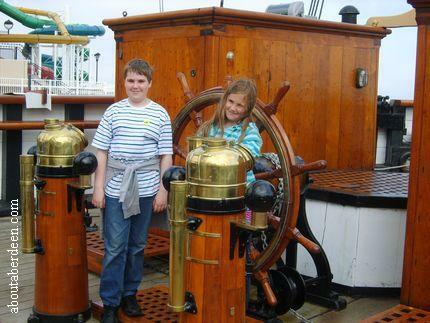 The film pays tribute to seaman Charles Bonner who fell to his death from the main mast when RRS Discovery was setting sail from Lyttelton Harbour in New Zealand. Scott hand picked 49 men for this epic voyage from the Merchant and Royal Navy, these included explorer Ernest Shackleton, zoologist Edward Wilson, the ship surgeon and botanist Doctor Reginald Koettlitz, the biologist Thomas Hodgson, physicist Louis Bernacchi and geologist Hartley Ferrar. 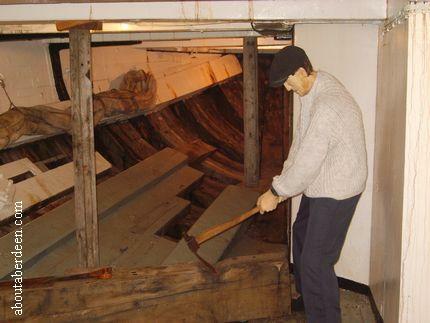 Locked In The Ice describes how RRS Discovery was finally freed from the 20 miles of ice by controlled explosions on the 16 February 1904 and what became of the sailors and crew after their arrival at Spithead on the Solent in Hampshire, England on the 10 September 1904. 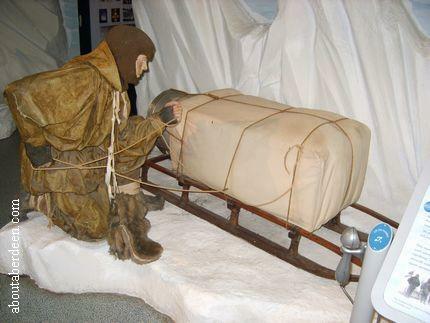 Part of the exhibition includes the fate of Captain Scott on his next expedition. Many of their artefacts, equipment and clothing are on display in the Discovery Point Dome. 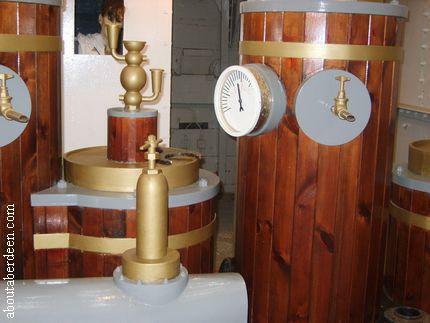 This includes the Grog Tub used to give the 1pm daily rum ration to the sailors. 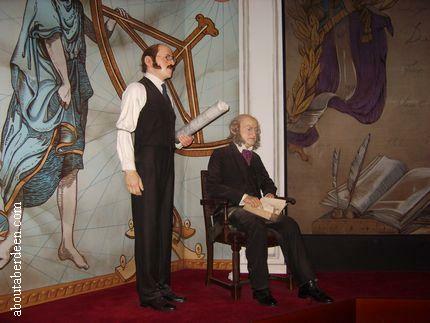 After exiting the cinema there is the scientific research and exploration room which has life size and realistic mannequins of the scientists who studied the area. 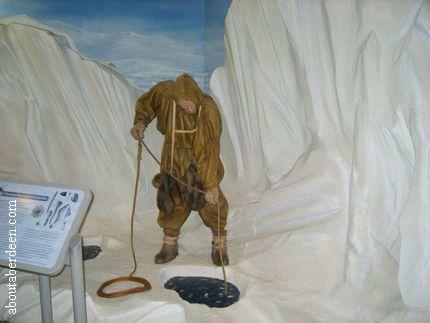 Another hands on display that the kids will enjoy is fishing through the ice in the Antarctic. There is a magnet on the fishing rod for them to catch the fish. 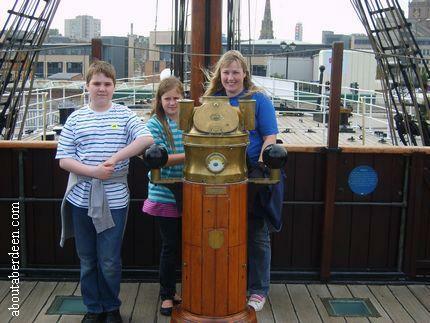 The history of the RRS Discovery Ship is also on display at the Discovery Point. 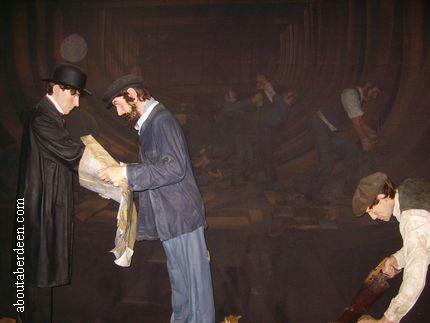 Soon after the expedition the Hudson Bay Company purchased RRS Discovery to be used as a cargo vessel. 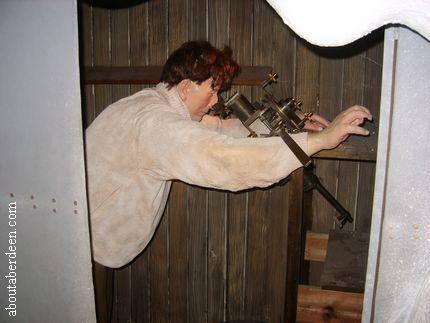 This included its use delivering ammunition to Russia during the First World War and then once more as a Royal Research Ship during the 1925 Discovery Oceanographic Expedition to research whale stocks. 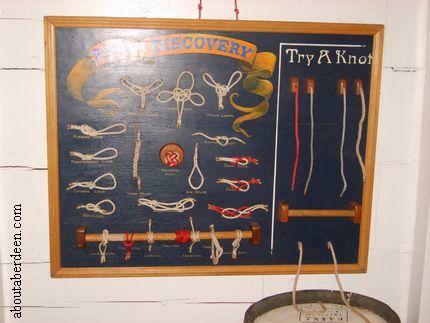 RRS Discovery was also used for the BANZAR Expedition (British Australian and New Zealand Antarctic Expedition) and then used by the Royal Navy Reserve and the Sea Scouts. 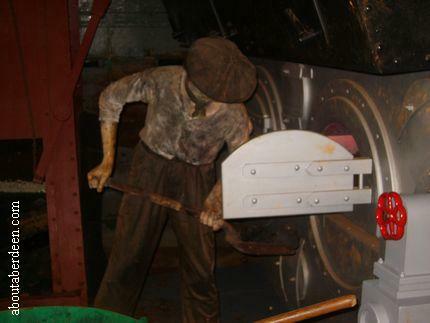 Recent restoration work is pictured in one display and much of the work was able to be performed after a half a million pound grant from the Maritime Trust. This took place between 1979 and 1986. 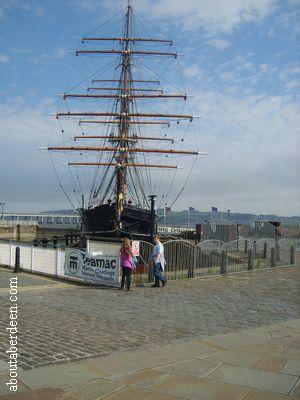 On the 3 April 1986 RRS Discovery was berthed at Victoria Dock in Dundee by the River Tay and opened to visitors. These all take place on one level and there is disabled access throughout. Visitors in a wheelchair cannot access RSS Discovery ship but do have a special viewing platform. 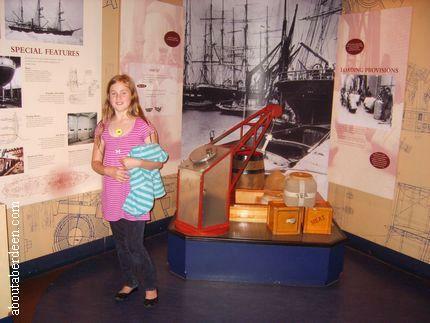 The end of the indoor exhibition now leads visitors to the magnificent RSS Discovery ship. Outside on the quayside are relics of the past such as cargo weighing scales, trolley and cargo wooden crates. There is even replica models of sheep in a pen waiting to go into the hold. 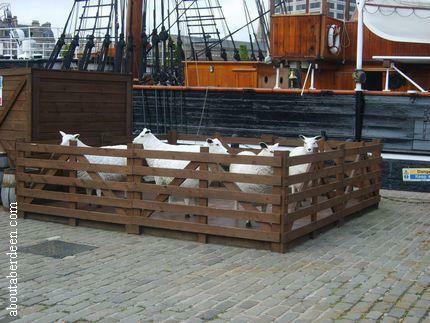 The sheep were donated to RRS Discovery by the farmers of New Zealand. Other animals on board included the ship's cat and 23 pack dogs. 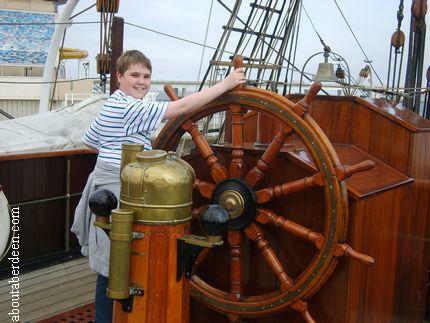 Entrance to RSS Discovery ship is via a gang way which takes visitors to the wheel and rudder. 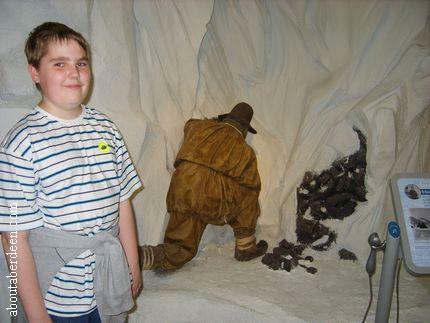 This makes a great photo opportunity, especially for the children. 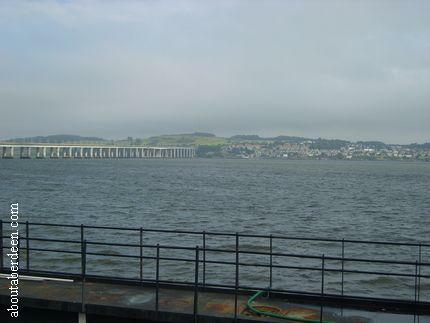 There are some fine views of the Tay Bridge and River Tay. 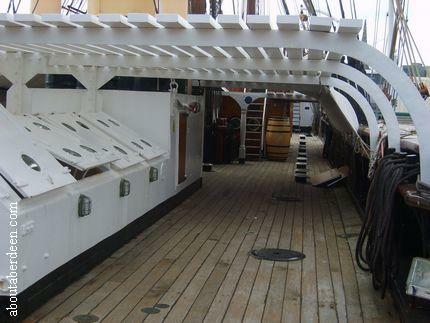 Do look out for the ankle bashers scattered around the deck which were used to provide light and ventilation below decks because normal portholes would have weakened the side of RRS Discovery in the ice. Many a member of the RRS Discovery crew have bumped their legs on these: hence their nickname of ankle bashers though they were officially called mushroom vents. 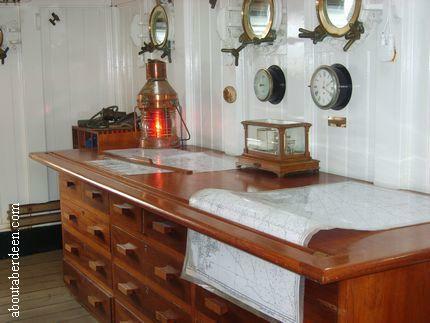 A stroll around the upper deck brings visitors to other rooms such as the chartroom and then the bridge with the steering wheel, compass and engine room telegraph. 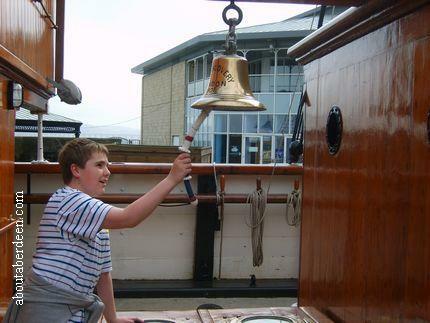 The ship's bell is here and is a focus point of the visit for many a child visitor. A one way system of going up and down the narrow ladders operates aboard RRS Discovery for safety reasons so please do not ignore the no entrance signs. Below the main deck takes visitors to the lower deck where the 450 horse power engines were located next to the huge coal bunkers. 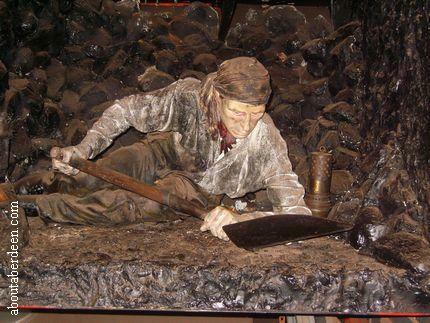 There is a model of an able seaman shovelling coal from the bunkers that held approximately 360 tones. Another 40 tons was stored on deck. Moving along takes you past where the provisions would have been stored. 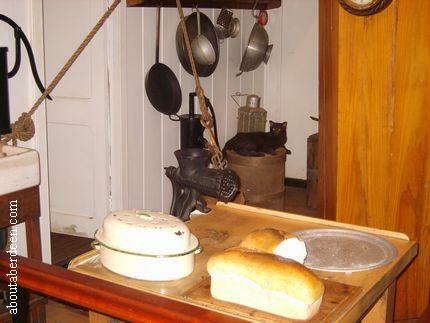 There is a model of the chef, Charles Clarke of RRS Discovery in the galley along with the ship's cat. 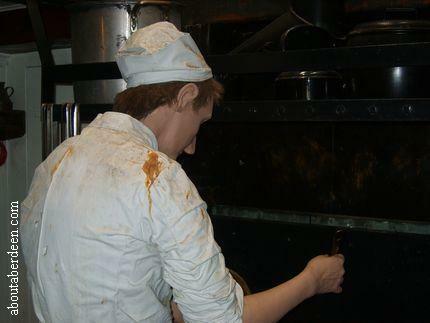 The galley has been modelled into the kitchen of that time period. Though most of the crew did not find roast penguin tasty they did find seal's liver to be a delicacy. The fresh meat was needed to provide vitamin c to prevent scurvy. Fresh meat would be hung on the rigging to freeze and store. 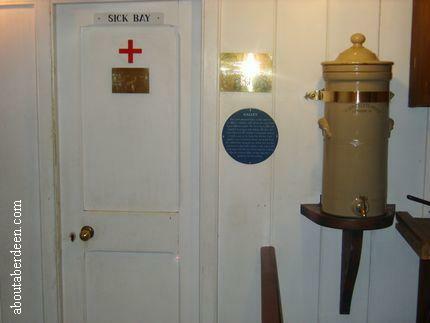 Next to the warm area of the galley is the sick bay. 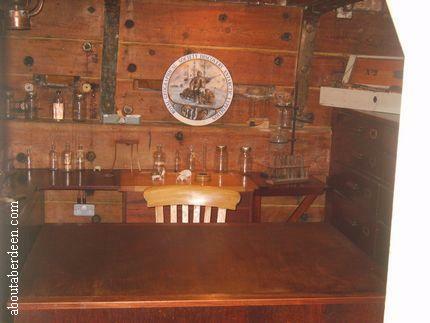 Next door is the mess deck where the crew not only ate but slept and kept themselves entertained through activities such as card games and cribbage. The crew compiled their own newspaper called The South Polar Times and examples are on display which includes the artwork of Edward Wilson. As you can see from the www.aboutaberdeen.com photographs there are bunk beds around the mess table. 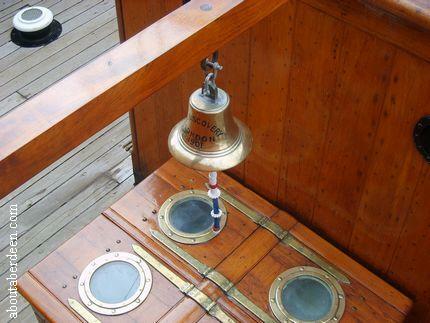 These were added in the year 1924 during a refit. 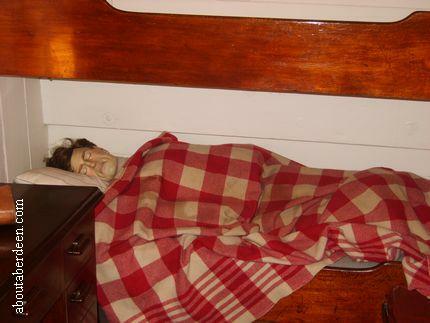 The RRS Discovery crew who went to the Antarctica would have slept in hammocks. In the next area are some more rooms which includes a purpose built dark room and laboratory for the scientists. 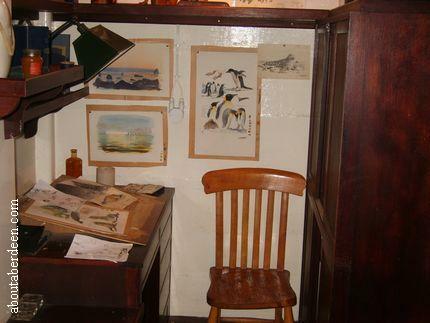 Naval discipline was maintained during the Antarctic expedition and the officers of RRS Discovery had private cabins and their own wardroom. The 1901 expedition saw ten private cabins. 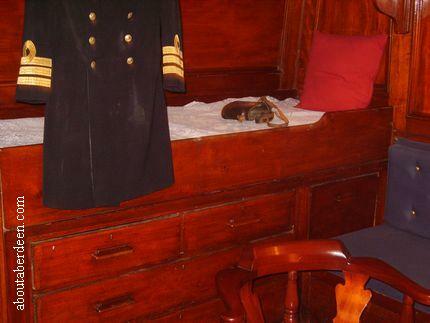 Some are replicated for modern visitors so don't be surprised to see Captain Scott sitting in his chair and another officer fast asleep in his cabin. These are in the pictures below. 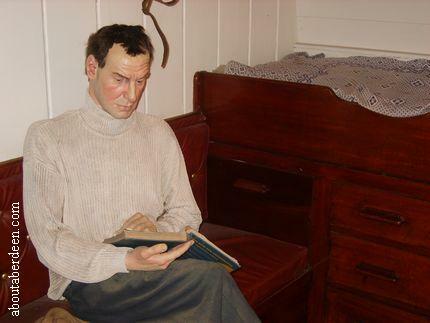 Though they look comfortable the sides of RRS Discovery was not lined and officers had to chip ice off their bedclothes and mattresses. 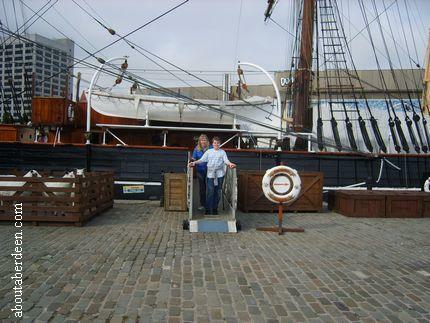 The exit from RRS Discovery is from another set of stairs and a separate gangway. After touring RRS Discovery visitors enter the Polarama room of the Discovery Point Visitor Centre to see a video of penguins swimming below the ice on the floor. There are displays of fossils and the continent of Antarctica. The Polarama leads to the gift shop which has many RRS Discovery gifts and Scottish related presents. Across the reception area is the cafe which sells a wide range of hot and cold drinks, light meals and snacks. 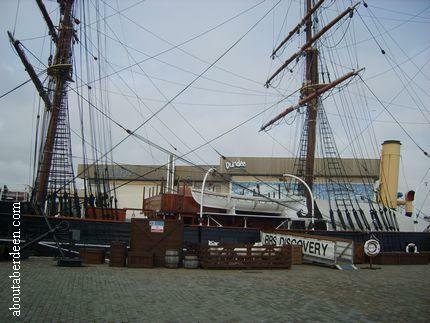 The opening times of the Discovery Point Visitor Centre and RRS Discovery ship in Dundee are from 10 am until 6pm Monday to Friday with an open time of 11am on A Sunday from the months April to September. 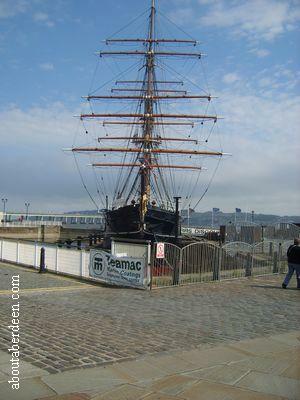 From October to March the Discovery Point Visitor Centre and RRS Discovery ship in Dundee closes at 5pm. It is open each day other than Christmas Day, Boxing Day, New Year Day and the 2 of January like most of Scotland as we recover from our Hogmanay celebrations! 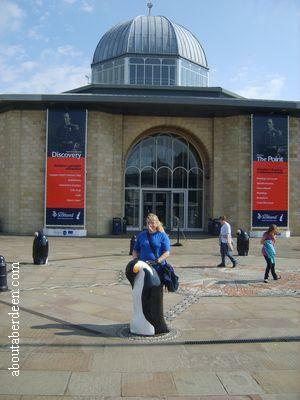 At the time of this aboutaberdeen.com Discovery Point Visitor Centre and RRS Discovery ship in Dundee review ticket prices were �7.50 for an adult with concessions at �5.75. Children pay �4.50 and those aged under five years gain free entry whilst a family ticket is �20. Group discounts are available. There is a car park with charges nearby and the building is located opposite the Dundee Railway Station. The building is sign posted with brown signs pointing to the Historic Ships.